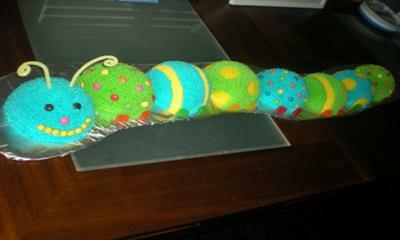 I came up with this Caterpillar Cake idea for my son's first birthday party! We weren't having a particular theme and also needed a large enough cake for up to 40 people. And with this cake, you can choose how big you want to make it. I used a round ball pan and just used each half for the caterpillar's body. The legs are just Ju-Jubes. I decorated the cake with some stripes and circles and then used smarties and skittles. It was a much bigger hit than I anticipated and am glad I took the time to make it!